Are you comforted by squeeze or steady pressure? Readers of my book Look Me in the Eye will recall my chapter about sleeping in piles, where I talk about how it’s comforting to have the weight of another person or a pile of pillows on me when I rest. My friend Temple Grandin has her squeeze machine, which accomplishes something similar in perhaps a more deliberate way. I’m almost 60, and I still feel that way. So does Temple, as far as I know. With that in mind, autism therapists sometimes use weighted blankets to soothe children, in yet another version of the same idea. 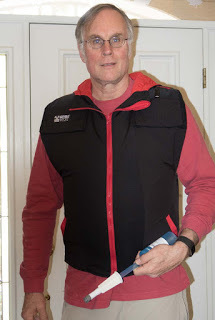 Lately, I’ve seen a few products come on the market that takes this idea to the next level, and I thought one was worth mentioning – the SnugVest. I first made its acquaintance at the 2016 National Pediatric Developmental Differences Forum in Chicago. The Snug Vest people had one of their vests on display and I tried it on. What a cool thing! The vest looks and fits like an inflatable life vest or water ski jacket. Anyone who has worn one of those will recognize the Snug Vest feeling. Putting it on made me realize why I like the feel of the vests in my little boat. Even fully inflated, you don’t look weird. Or at least no weirder than you looked before putting it on. The inflated vest just makes you look a little bit more solid, or chunkier. It’s like, autistic style. One thing I particularly like is that the vest squeezes me around the chest where it feels soothing and not around my stomach, which just feels like someone sat on me. It’s a simple product idea that is implemented nicely and works like you would hope for. A few years back I heard about another company that was developing a similar inflatable vest, and they were aiming for FDA approval so its cost could be covered by insurance. I thought that was a fine idea, but the cost of getting FDA approval was huge – potentially millions of dollars – and that promised to make any approved vest a very expensive item indeed. The Snug Vest does not carry that burden, and it is reasonably priced – $365 as of this writing, in the USA. They were offering 20% off when I saw them in Chicago, and I have to expect similar deals can be found in the future. For less than $300 this is a no-brainer. Just one meltdown averted and it’s worth the price. If it averts two meltdowns remember you heard about it here, and send us $20. At that price, a Snug Vest is about the same cost as a high-performance inflatable life vest and considerably more soothing, if you are an autistic person or just someone who’s comforted by steady pressure. And its air chambers offer some level of flotation, so if you find yourself unexpectedly deposited in a lake or river, the vest will help keep you afloat. But it won’t look like you are walking around wearing a life jacket, which many individuals would find dorky. Plus, the design of the vest is very similar to the design of the under-seat life preservers found on many regional jets. Snug Vest wearers can be assured of having a leg up over other travelers in the event of a water evacuation from one of those aircraft. Less fortunate passengers will be struggling to don their aircraft vests while you step out the window and enter the water in style. Another thing about a Snug Vest is, it makes you conscious of being overweight. It’s the opposite of baggy clothes. So it’s a good thing to wear, to encourage better eating habits. When fully inflated you will find it effectively deters gluttony. I travel to quite a few autism schools, and I’m seeing more and more interest in ideas like this to help soothe kids. If you run a school or you are a therapist in a school program, I’d encourage you to check these vests out. Blanket, pillows, and weights are nice, but you can’t take them with you to class, or wear them on the bus. These Snug Vests can go anywhere and no one will have a clue they are really something special. The company representative assured me their products were made in Canada by real people and not machines. Like many Canadian-made things, quality is good. I don’t really describe or review many products on this blog, but this is one item I can definitely give two thumbs up to. Here is a link to the Snug Vest website. John Elder Robison is an autistic adult and advocate for people with neurological differences. He’s the author of Look Me in the Eye, Be Different, Raising Cubby, and Switched On. He serves on the Interagency Autism Coordinating Committee of the US Dept of Health and Human Services and many other autism-related boards. He’s co-founder of the TCS Auto Program (A school for teens with developmental challenges) and he’s the Neurodiversity Scholar in Residence at the College of William & Mary in Williamsburg, Virginia. The opinions expressed here are his own. There is no warranty expressed or implied. While reading this essay may give you food for thought, actually printing and eating it may make you sick. John grew up in the 1960s. He knew he was different, but didn’t know why. His early social and academic failures would be signs of disability today, but back then, they were dismissed as laziness or a bad attitude.